A new version of the Android Messages app slowly began to circulate over the weekend. As usual, there doesn't seem to be anything visibly different in this update, but it does contain bits and pieces suggesting there's plenty of work going on in preparation for new features. Some of the Sticker and GIF-related enhancements from Allo appear to be making the transition to Messages, and we may also be getting some helpful search filters that bring attachments into view. There's also some new text that suggests Google is looking to take a more active role in combatting text spammers. Android Messages appears to be taking a few notes from the development of Allo. It appears there will be a native GIF search coming to the texting app, ensuring that users will have a way to share the dankest of memes even if they're not using a keyboard with built-in GIF support. Naturally, this will look and behave just like the GIF search previously found in Gboard and later added to Allo, so there's no reason to dive much further into the subject. Even the automatically filled categories match up: High five, Clapping, Thumbs up, No, Yes, Shrug, Mic drop, Sorry, Cheers, Thank you, and Wink. Sticker management may not be a top priority for everybody, but there is somebody looking out for your sticker interests. Signs in the latest update suggest the sticker interface is going to gain a dedicated space for your favorite stickers or sticker packs. Like many other apps, you'll be able to mark stickers that you want to be readily available so you won't have to scroll through your full collection to find the ones you use regularly. It is a little unclear if the Favorites section is reserved for individual stickers or entire sticker packs, both are mentioned in one way or another within the strings. In either case, it seems a double-tap will be used to mark and unmark favorites. In fact, a double-tap will also be used to open a dialog with more information about a sticker pack, to open the Play Store, and possibly a couple of other things. If you need to look up an old text, Android Messages does provide a straightforward search feature. Unfortunately, it's limited to a simple keyword match, and that might not be very helpful if you're trying to dig up a picture or link from a few months ago. Google may be adding a new filter that should make it a lot easier to dig up attachments. It appears that users will soon be able to pull up messages containing links, locations, photos, or videos. It's hard to say with certainty that these filters will work alongside the keyword search, but it looks like they will. 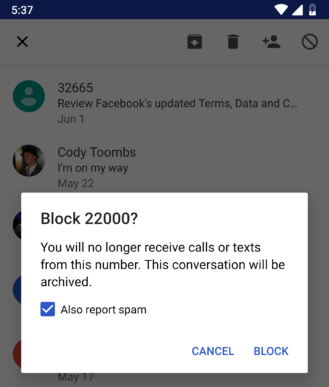 If you've been blocking the phone numbers of disrespectful spammers and scammers (or whatever else), you may have seen an extra checkbox on the blocking dialog. It asks if you'd like to report sender for spam. Not all phones are going to have this option, I believe it only appears on certain carriers. I'm also not entirely sure if the reports are going to Google or the carrier, though I would expect the former. Regardless of where reports are currently going, Google has added a new line that suggests future reports will be headed back to The Big G to contribute toward tracking down spammy senders. It's slightly unusual to see Google asking to gobble up as many as ten messages from the spammer, but that's likely to be all about collecting more data for the purpose of analysis and comparison with other reports – and really, who among us cares what Google gets from a spam report. The new message doesn't currently seem to replace the existing message, and I haven't seen a place in the UI, so it may only be shown in specific circumstances. These reports will almost certainly contribute to an anti-spam feature for text messages, much like the automatic spam warnings in the Phone app. However, if it's using the content of the spammy text messages in the same way it does with spam detection in Gmail or Google Voice, it could actually prove to be far more effective than the blocker for spam callers since there's no mystery about the nature of the message.